The pyroligneous extract is an organic substance resulting of condensation of the smoke generated by the carbonization of the wood. It has at least 80% of water and contains several compounds. It is hypothesized that some of these compounds could have preservative properties for cosmetic and sanitizing products. 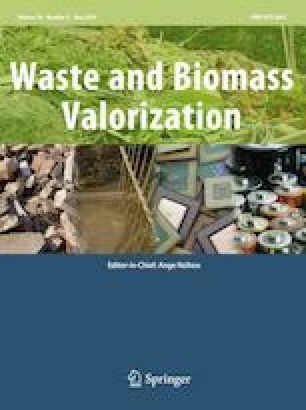 This study evaluates the characteristics and antifungal properties of the pyroligneous extracts from eucalyptus wood, obtained from (i) laboratorial and (ii) commercial production. 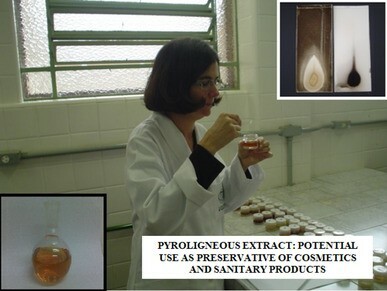 The possibility of using the pyroligneous extract as a preservative is also assessed, comparing it with formaldehyde. The chemical compounds of both extracts were identified by a gas chromatograph connected to a mass spectrometer (GC/MS). In general, oxygenated gamma components, such as carboxylic acids, esters, ethers, and ketenes, were identified. Phenol, guaiacol, and phenol derivatives were also detected. The best antifungal results were obtained with laboratorial pyroligneous extract. The potential actives under consideration from the samples were: corilon, mequinol, 2-metoxy 4-methylphenol, 4-ethyl 2-methoxyphenol, 2,6-dimetoxyphenol,1,2,4-trimetoxybenzene, and 5-tert-butylpyrogallol. Toxic compounds were found in both studied extracts, which restrict use in cosmetic products, as they require previous removals, although they are still promising in sanitising products.